Well, of course I think this is awesome! I can only hope to show how truly useful this is. Between dynamic arrays, functions with bodies, and variables, that vary, RapCAD is addressing the most significant constraints I have had in trying to utilize OpenScad. A common back-end would be awesome!! 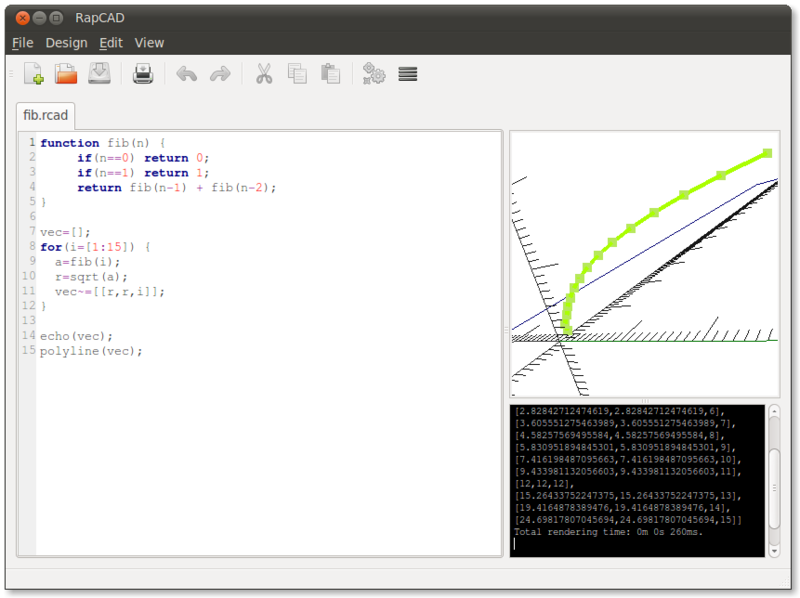 I am a huge fan of the improvements you are making in the language/back-end, but I like the simplicity of the openscad UI (i.e. being able to use an external editor with openscad auto-recompile). I know what you mean. I could add external editor support via an auto-recompile feature. However RapCAD is intended to be an Integrated Development Environment. I was able to use my connectors without any pain. A single file, with simple stuff, no includes, etc. The RapCAD IDE is fine for me. If the multi-file support works as you intend, it will be more awesome. right now it’s a bit of a challenge, although no worse than OpenScad. Personally, if you went the path of just improving the CSG functions, and skipped the GCode thing, that would be fine. GCode is highly specific to a machine, and does me no good on my Up! for example. Multi-file support should be working better now in 0.4.0 can you tell me a bit more detail about any problems you are having? I get your point about the GCode not being suitable for other printers, but at the end of the day my main motivation for all this is to be able to print stuff on my RepRap.